Laura Boswell followed two corrections officers through a series of sliding doors into a silent, two-tiered hall, lined with 11 closed, solid-steel doors. One, on the bottom right, stood open. The 28-year-old attorney from the Disability Law Center, which advocates for Utah’s disabled, had gone to Uinta 1, the Utah State Prison’s maximum-security wing to check up on 26-year-old inmate Jeremy Haas, following allegations by another inmate of abuse and neglect by the prison. First, she was to inspect Haas’ cell. What struck her was how narrow it was. Bedding lay on a metal slab that jutted out from the wall, taking up half the cell’s space. There was a small sink, some crumpled papers and a line of small shampoo bottles. Haas was arrested in 2007, a week after his 18th birthday, and charged with robbery, possession of a stolen firearm, discharging a weapon within the city limits and reckless burning. A 2nd District Court judge in Ogden found Haas, who has an IQ of between 58 and 68, competent to stand trial. Haas was sentenced to 1 to 15 years. Kinikini, who’s a former criminal defense attorney, says, “Your garden-variety criminal is probably going to do two years,” on a 1 to 15. Haas has already served six years. That’s because inmates with mental-health diagnoses—Haas’ attorney described him in court as having “mild mental retardation”—are often unable to cope with the stress and regimentation of prison, which leads them to act up, say other prisoners, mental-health experts and relatives of Uinta 1 inmates. They say that rather than treat their mental-health needs, the prison keeps them in solitary confinement—administrative segregation, as the prison calls it—until they behave. But “Once in segregation, continued misconduct, often connected to mental illness, can keep the inmates there indefinitely,” wrote Jeffrey L. Menzer, M.D., and Jamie Fellner in The Journal of the American Academy of Psychiatry and the Law. Which brings them to the harsh embrace of Uinta 1. Inmates are some of the few people who still correspond via handwritten letters. 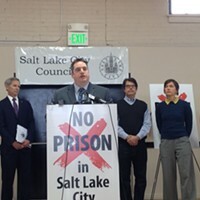 City Weekly has received correspondence from 10 or more inmates, all expressing concern over housing conditions in Uinta 1. The most eloquent advocate from Uinta 1 is one of its longest residents, Paul Payne, 37, who has been in prison for 21 years, currently serving five to life for aggravated robbery. City Weekly identified four inmates, all in their 20s, all being held in Uinta 1, all with mental-health issues. Requests to interview Jeremy Haas, Cameron Payne (no relation to Paul Payne), Ryan Allison and Coleman Stonehocker were denied by the prison. The prison also denied City Weekly’s request to tour Uinta 1, citing security measures. A records request seeking the number of mentally ill inmates in the unit and the number of suicide attempts and suicides that have occurred there were denied on the grounds that the prison lacks the resources to compile such data. The only way to ask inmates questions, then, is by letter. Three of the four responded. While grammar, spelling and syntax may be unorthodox, the words of these four men and those who advocate for them in neighboring cells paint a chilling picture. Inmates in intensive management are allowed out one at a time, three times a week, for a 15-minute shower and an hour in a recreation yard. They are cuffed through the port in their cell door and guided backward by an officer holding a leash. Some have to wear a spit hood, a thick mouth-covering cloth with netting that covers an inmate’s head and prevents them from spitting at guards. Inmate Jacob Vigil writes that the yard is “a tiny outside rec area with no work out/exercise equipment. In cold weather, the whole section has to share a flimsy dirty coat that does not keep you warm.” Inmates are allowed no visits, are offered no life-skills or other programs, and no personal phone calls. Legal access is only through the unit’s caseworker. Inmates describe sections of Uinta 1 as akin to a 19th century asylum, where “95 percent of the time you can’t hear [neighboring cellmates] due to all these mental-health cases banging, yelling, crying, screaming, fighting [guards], breaking sprinklers, etc,” writes inmate Curtis Allgier, who’s currently awaiting trial on a capital murder charge for allegedly killing prison guard Stephen Anderson. Kinikini argues that “there’s no valid or legal-based treatment for keeping someone in a hole. There just isn’t.” His and Boswell’s priority, he continues, is getting Haas and inmates in similar situations out of solitary confinement.